Which Disney World character meet and greets offer Fastpass+? 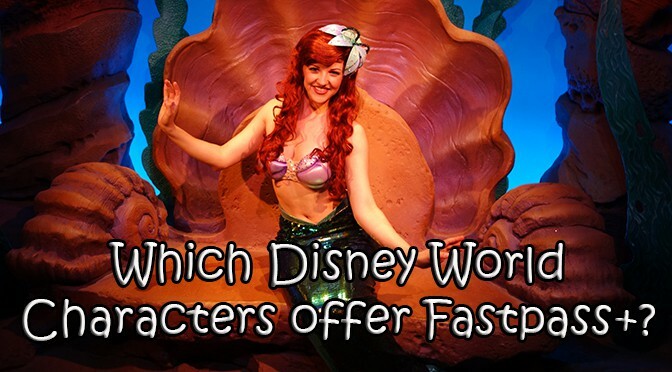 I’m often asked this question via email and Facebook, so I thought I’d create a simple post that explains which character meets offer Fastpass and which ones would have priority. I’ll update this post if things change in the future. Meet Mickey and Minnie at the Adventurers Outpost. The MyDisneyExperience app actually refers to this meet as “Meet Favorite Disney Pals at Adventurers Outpost.” The photo shows Mickey and Minnie, but it doesn’t specify the characters. This is the ONLY location that offers Mickey and Minnie in the same photo in the same location. Use this as a 3rd or 4th Fastpass option. Meet Mickey, Minnie and Goofy at the Epcot Character spot. The MyDisneyExperience app calls this meet “Meet Disney Pals at the Epcot Character Spot.” Again it doesn’t specify the characters that you’ll meet. Mickey, Minnie and Goofy are each in the same room, but in separate photos. They actually increased the wait times at this location by moving it from Tier One to Tier Two. Use it as a 3rd or 4th Fastpass. NONE – it could sure use Fastpass+ for some of it’s meets like Buzz and Woody, Sorcerer Mickey and Starlet Minnie. The Magic Kingdom offers the most Fastpass+ enabled meet and greets. There are 5 different formal meet and greets and Enchanted Tales with Belle offers a brief photo opportunity at the end of the show. Meet Cinderella and Aurora or Rapunzel and Tiana at Princess Fairytale Hall. This is a very popular meet and greet and can pull lines of an hour or more on the busiest days. If you are visiting the Magic Kingdom twice on your vacation, you might consider making Rapunzel of your top 3 on of these days. Meet Mickey Mouse at Town Square Theater. Mickey is popular, but not as difficult to get Fastpasses for as the Princesses. He can usually be met with a 4th or 5th FP with little effort. He could also be met at park opening, during a parade or late at night. He usually uses magic and speaks to you at this meet, but it isn’t guaranteed. Meet Tinker Bell at Town Square Theater. When Tinker Bell met with the other Pixies in Adventureland, there was always a long line, but since she moved to Town Square Theater, there is rarely a long line. The attraction was meeting other fairies in addition to Tink. Use a 5th or later FP+ for this meet, go at park opening, during a parade or late at night for no wait. Enchanted Tales with Belle. In the normal sense of the term, this isn’t a traditional meet and greet. It is an interactive show that offers a very fast photo opportunity at the end of the experience. A Photopass person will take the photo, but you can also snap it with your own camera (no flash). Use a 4th or later FP+ for this experience. Wow that was a quick response. Appreciate the advice. Will do. Thanks again. Do you have any idea how long the wait is WITH A FASTPASS for Anna and Elsa? I have fastpasses for my family in July at 3:00-4:00pm (earliest time I could get). We also have 8:00 a.m. BOG reservations for that same day (9:00 a.m. opening). If we’re able to meet Anna and Elsa first thing in the morning with minimum standby wait time, I might just do that instead. However we also want to ride Mine Train first thing…..which is why I was wondering how long the fastpass wait is for the sisters. If the Anna and Elsa fastpasses are over 20 mins, I’m thinking that maybe I’ll be better off trying to snag a place in line ASAP and just changing my fastpasses to something else in the afternoon. Thanks again for any insight you can offer. Can we book FP+ only for the kids (to meet a character), then mom and dad will get in with them and wait for them to take their photos with the character? Regarding Ariel’s Grotto. For some reason the waiting area is NOT Air Conditioned. It can get extremely humid in the shaded area. No air movement due to walls on three sides.